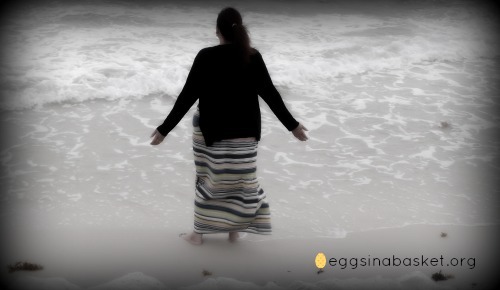 I am emerging from a challenging season in my life. I’ve been engulfed in waves of hurt inflicted by other Christian brothers and sisters. For me, it seems easier to forgive the lost or unintentional inflictions over the stabs gathered by those who are suppose to be my family in Christ. My community. . .my church. . .my friends. . .my loved ones. One thing I know is true about being in a church community. . .if you have not yet been hurt. . .you most likely have not opened up your heart, exposed your true self and invited those around you to jump fully into your life. The church is a hospital for the spiritually, emotionally, and physically injured or broken. It is a safe haven of hope in the name of the Lord Jesus Christ. It is where we can feel safe to open up, expose our broken and pray for healing. It is also a group of sinners, just like me, clinging to God’s great grace and mercy. I am broken. . .I am messed up. . .I am a sinner. . .I am a Child of God! If I am a sinner and I am in fellowship with other sinners. . .just what do I expect? Why am I surprised when others just like me sin against me? I have spent many hours weary and wondering just why this kind of thing happens and what next? I think relationships in the family of Christ become strained when one loses focus on God and projects that gaze on the lives of others and self. The horizontal view overtakes the vertical view. And when we take our focus off of God. . .we sink, we fall. It’s funny, when I see those pictures that depict Peter who had been walking on the water with Jesus and then begins to slowly sink ankle deep as he loses his gaze on and trust in Christ- it looks so peaceful. I don’t think this is entirely accurate. I believe when we take our gaze, our focus, our eyes off of Jesus, we plunge furiously into the sea with waves crashing over us. Head under water. . .we sink. We gasp for air only to find water filling the lungs. We thrash around violently as we panic in fear. We fight to get head above water and we choke and cough as the storm throws us around in between swells of fear and doubt. There is no peaceful slow sinking when we take our eyes off of the Lord. No God. . .no peace. . .no life. . .no air. Life is a struggle without our God. When we try to make it on our own or fix life the way we see fit. . .we are simply gulping more and more sea water and suffocating. The horizontal view bouncing back and forth between self and others is exhausting and a losing battle. The fix? Look to Christ. When we take our eyes off of our situation, the people sinning around us; When we put down the cake at our self- prepared pity party. . .we can once again see God. We can fix our eyes on His and guess what happens? We rise. We find air to breathe, we no longer struggle as we reach up to hold the hand that holds us. And we can once again walk on the water with Jesus. We have peace as the waters are calmed in the light of His great presence. But what about the hurt? What about those darts that hit so hard? While many do not sin when sinned against- we often get caught in the sink hole of sin that is caused by our reactions to the hurt. I have a tendency to put up my guard. “You hurt me, so I’m boarding myself up in my little castle surrounded with my own alligator-filled mote. Don’t even try to cross over to knock on my door.” This hard exterior is the build up of hurt turned calloused. We lash out at others and offer our view without care or concern. I am more guilty here than I’d like to admit. I could barely go a day without complaining to my husband or mom about what this person did or that person said to me. If someone asked if I was ok, I was more than willing to share my hurt and without care of those involved. The hurt had now morphed into a full grown grudge and I wasn’t afraid to share that grudge like a well spawned virus. For literally almost a year, my hurt and anger flowed like poison through my veins. And it has been killing me. I went under and the waves nearly carried me away. 1. Cry out to God! Who better to tell your secrets, your dreams, your wants, your hurt, your sorrow to? God knows me more than any other. He created me. He dreamt me into existence. He knows my thoughts before I do. So, instead of griping to my husband or gossiping to my mom, I can talk to God anytime and unleash my entire heart. He knows all about hurt, about betrayal, about those who turn their backs. God has been right where I am. 2. Look UP to God! Wounds often turn self-inflicted when our gaze turns from Vertical towards God to a horizontal view of those around us. Our self-centered take on the situation keeps us busy bouncing back and forth between you and them. There really isn’t time to look up and spend time with God. This is where the Grace of God hits hard. No matter how many times we have sinned, fallen, quit and taken our eyes off of the Lord, he is always there for his Children. Opened arms, his grace is greater than my deepest sin and He will always extend his forgiving grace to me and rescue me from myself. His hand reaches towards ours and if we take His hand. . .we once again rise to the water’s surface. 3. Trade in your Fear of Man into a Reflection of God’s great light. Hanging on a cross. . .bruised. . .beaten. . .battered. . .tired. . .betrayed, Jesus kept his focus on his father and his purpose on earth. His perfect life and precious death is our cheat sheet in times of betrayal and hurt. As children of God, we are to reflect the light that was sent to suffer in our place. That perfect pure light named Jesus Christ. He is the perfect “Adam” that paid for our sin; and our goal is to strive to reflect His light. Knowing this. . .knowing our great God and his love for us, we can offer forgiveness to those who have injured us so badly. We have done so much worse to our Lord than any man can possibly do to us. We are not without fault. Because Jesus took on our sin in the flesh and put our sins to death- because of his great grace extended to us. . .we can now offer as reflection to the light- our own forgiveness to others. This life. . .THIS life is not about us at all. It is about a Great creator and God that sent His beloved son to right the wrong that sin caused. The great rescue to the perishing. The great forgiver who forgives. We serve our purpose in life when we give glory to God in all that we do. And forgiving those who hurt us in this great big family of God gives glory to God. 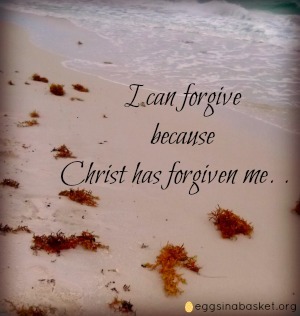 I can forgive because God has forgiven me. I am free to let go of the hurt because my savior died on the cross so that I do not have to hurt. My hope and joy are in Him. My gaze on the light of His face blinds me from all others. In Him I live, in Him I rejoice, in Him and only in Him. . .I forgive.